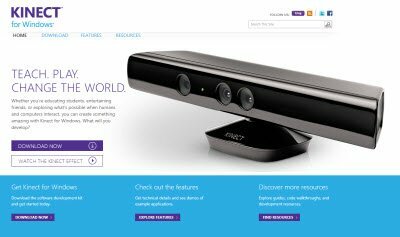 Microsoft has launched the Kinect for Windows website. In fact it’s more than just a website – it really kick starts the journey for the Kinect for Windows commercial program that’s coming in early 2012. Whether you’re educating students, entertaining friends, or exploring what’s possible when humans and computers interact, you can create something amazing with Kinect for Windows. Apart from including support for Windows 8, the updated software brings new features such as faster skeletal tracking, better accuracy rate when it comes to skeletal tracking and joint recognition, and the ability to plug and unplug your Kinect without losing productivity. Download more resources, guides, code and walkthroughs. You can download KinectSDK and do more at the KinectForWindows website. Can I just get a good way to use my webcam as a Kinect and use my finger as a pointer? This is one of the best news I got online. I can now buy Kinect and use it to my windows based PC.